The major macroeconomic indicators. The U.S. economy had strong momentum as 2015 ended. Recently revised employment data shows that 851,000 jobs were added in the Fourth Quarter, bringing the total to 2.7 million for the year. This allowed the unemployment rate to fall to 5.0%, an improvement of 10 basis points since September as the rate of new hires tracked by the Bureau of Labor Statistics rose at a 3.6% rate. Inflation for the year was near zero, a mixed blessing: good for consumers, but not so good for retailers; and downright bad for the oil and gas producing regions of the country, which now see crude prices down to $30 per barrel or below. Financial markets started the year in bearish humor, reacting to news of a slowdown in China and fears that Iran’s return to the energy markets will exacerbate the already severe oil glut. The major policy indicators. 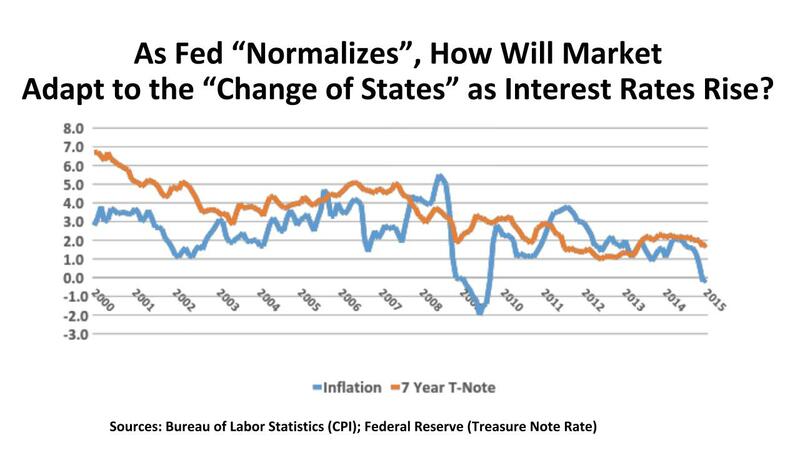 The long-anticipated “normalization” program for the Federal Reserve was initiated by a modest 25 basis point increase in short-term rates by the Board of Governors. The plan is to move rates upward with great caution, depending upon economic trends. A five-year, $305 billion Transportation bill was passed and signed into law with just hours to spare in early December, providing funds for both highway and transit programs. However, with just 115 laws passed in 2015, the 114th Congress is on track to be one of the least productive in history. Fiscal policy has been hostage to gridlock in Washington throughout this current decade. In a presidential election year, it is unlikely that any meaningful new initiatives will alter Federal policy in 2016. The Outlook. Forecasters are increasingly jittery about American economic growth in 2016. 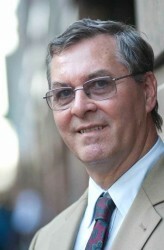 The Blue Chip Economic Indicators panel held its prediction for real GDP increase to 2.5% in both 2016 and 2017, but the fifty economists comprising the panel express concerns about the impact of a strong dollar on U.S. export, worries about an international slowed in China and other emerging markets, and the overhang of excess supply of petroleum in the world markets. Interest rate increases should be expected, but not disruptive to growth. If oil prices have bottomed out, a small (and somewhat welcome) uptick in CPI inflation can be expected. On a positive note, the forecasted jobless rate is anticipated to drop to 4.8% in 2016, and 4.6% in 2017, producing some growth in incomes and in consumer spending. Employment Trends. 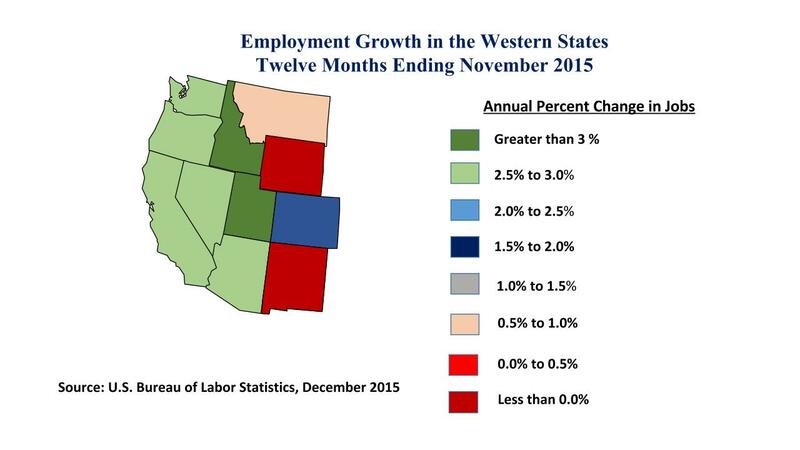 Seven of the eleven states in the Western region saw robust employment growth of 2.5% or more in 2015. California led the nation in absolute job additions, with 417,100 (2.6%). But in terms of year-to-year percentage change the laurels go to Idaho (4.2%; 27,600 jobs) and Utah (3.6%; 47,800 jobs). The two Pacific Northwest states also outpaced the nation in job expansion, Washington posting a 2.9% increase (89,300 jobs) followed by Oregon (2.8%; 48,100 jobs). Even the “sand states” of Nevada and Arizona are on the rebound after the housing market collapse in the Great Recession. Both are posting 2.5% job increases this year, adding 30,900 workers in the case of Nevada and 64,700 for Arizona. What weakness can be discerned is in the largely rural states, especially those with ties to energy. Wyoming slipped by 2,100 jobs in 2015, and Alaska added just 500 workers statewide. Both New Mexico and Montana had job gains below one percent for the whole year. Even tiny East coast states like Rhode Island and Delaware added more jobs than these vast states in the year just ended. Macro-economic conditions. To begin, let’s accentuate the positive. Technology, commercial aircraft production, consumer and business services, and the financial sectors all enjoyed good performance for the year. In contrast to many areas of the country, construction activity – especially in the housing sector – is a source of economic energy in many Western markets. That’s good news for retail firms, for one thing, as new households mean more shoppers. And there is a reported shortage of labor and materials for home development. This may be alleviated shortly, though, as blue collar workers being laid off in the energy industry often have experience in homebuilding as well. It is the water issue that most seriously hangs over the West’s economic future. The prolonged drought made for another dreadful fire season throughout the region, and challenged growers and ranchers with reduced allocations and with higher water extraction expenditure. Recent rainfall has dropped the area of most severe drought to 12.3% of the region, down from 18.5% a year ago. But there are still 44,121,290 people in drought-afflicted areas of the West. Office. 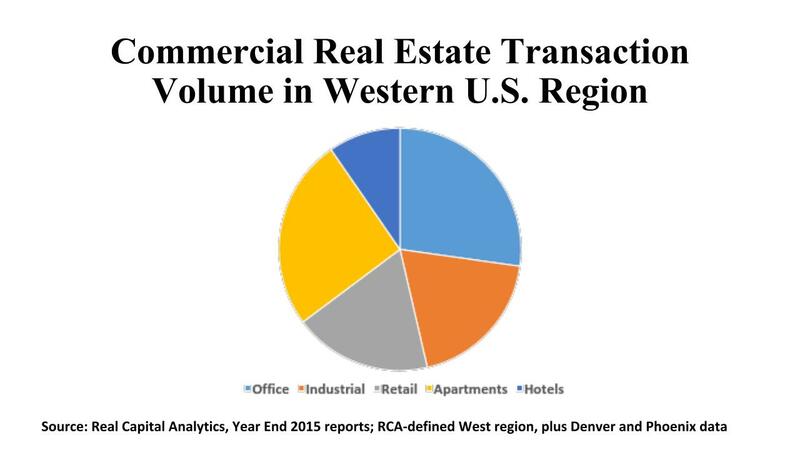 The West’s office markets tallied $45.3 billion in investment sales during 2015, or 31% of U.S. acquisition volume for this property type. Suburban office sales are by far dominant segment, with $33.6 billion (or nearly three-quarters of the regional total). San Francisco and Seattle continue to post solid CBD office sales at approximately $3 billion apiece. This befits their status as a 24-hour city (in San Francisco’s case) and an 18-hour downtown (for Seattle). But the big numbers have been in Los Angeles’ far-flung suburbs, which generated $6.4 billion in 320 deals. Orange County’s suburban office totals exceeded $3.4 billion in 171 deals. Both LA and OC have sub-6% cap rates for suburban offices at the point. In northern California, San Jose is rivaling LA, with $6.1 billion in suburban transactions, at an even more pricey 5.4% average cap rate. Denver, Phoenix, San Diego, and Seattle all registered between $2 billion and $3 billion in suburban office property investment during 2015. Nine of the top 20 markets in Emerging Trends in Real Estate’s survey of markets on a “Buy/Hold/Sell” recommendation are in the West (not surprising given the above figures). It is interesting to note that Portland (OR) ranks in the #4 position on Emerging Trend’s list, even higher than Los Angeles in the #5 post. In addition to the already named markets in the previous paragraph, we find San Diego at #18 on the Emerging Trends ranking. Seattle (#20) is seen as particularly well balanced in its CBD/suburb market strengths. Denver is growing as an 18-hour downtown, as is Portland. San Diego’s concentration in the sciences and technology is considered a key to its future office outlook. Industrial. When Real Capital Analytics reviewed industrial market performance in 2015, it found six of the most active U.S. markets to be in the Western Region. These half dozen markets alone accounted for $18.2 billion in property sales, which is 23.7% of the nation’s industrial sales for the year. All told, the industrial markets in this region saw $28,7 billion in investment sales, a 38.8% share of the U.S. volume in this property type. The Inland Empire, L.A., Seattle, the East Bay, and Orange County have seen particularly strong buyer interest from international investors. In most of those locations, cross-border investors have represented a 37% to 46% of purchase volume. Institutional investors like Clarion and Black Rock, owner-users like Facebook, and REITs like ProLogis have been active as well. Cap rates for warehouse assets have averaged 5.8% in the West’s markets, compared with 6.7% as a national average. A similar differential exists for Flex space, with a West regional cap rate of 6.1% versus the norm of 7.0% for the nation as a whole. Seattle ranks at the very top of Emerging Trends’ “Buy/Hold/Sell” list for industrials. Seven other Western markets make the Top 20 for this property type: Denver (#6), LA (#8), the Inland Empire (#11), Portland (#12), San Jose (#13), Salt Lake City (#15), and Phoenix (#19). Retail. Strong employment growth and an ongoing housing market recovery have been setting the stage for substantial retail property investment in the Western states. As was the case in industrials, cross-border investment was especially strong for markets like Los Angeles, Phoenix, San Francisco, and Portland. But international investors also were active in Central California and other tertiary markets in the West. L.A. led the region, with $5.5 billion in retail deals in over 400 shopping property deals. This placed Los Angeles in second position nationally, after Manhattan’s $7.2 billion total. In contrast to the Central region, malls and power centers outpaced neighborhood and community center deals in the West. The Emerging Trends’ “Buy/Hold/Sell” survey offered some intriguing results for this region. Portland (OR) ranked highest, #4 on the “buy” list, just ahead of L.S. in fourth place. In all, this region placed eight markets in the Top 20: Orange County (#9), San Jose (#10), and San Francisco (#11) clustered together. Honolulu ranked 14th, San Diego 18th, and Seattle 20th.